Our regulatory experts help you understand and meet global hazard communication requirements to ensure compliance. 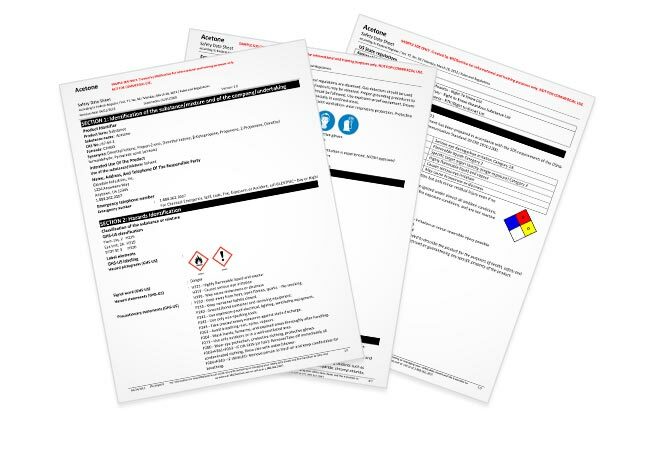 Need to Make Sense of Complex Hazard Communication Regulations? If your organization manufactures, imports, stores, or distributes hazardous chemicals, it’s easy to feel overwhelmed by the various domestic and global regulations that you have to manage. Understanding the often complex requirements involved in achieving and maintaining compliance takes a great deal of time, experience and training – and sometimes even a background in chemistry, toxicology, or biology. You may face a range of questions such as, “How do I register my products for trade secret or confidential business information protections in North America?,” “Is my product considered non-hazardous in the European Union?,” or “How do I classify this product for transportation?.” Or perhaps you have thousands of products that need to be evaluated and classified for GHS. If you’re like most EHS professionals, you don’t have enough time or resources to figure out the answers to all of these questions and tackle all of the related responsibilities. VelocityEHS can help. Through our Regulatory Consulting Services, we offer a highly trained team of regulatory analysts and authoring professionals equipped with the experience and knowledge required to provide guidance on even the most complex regulatory questions and projects. With the help of our regulatory experts, you can focus your attention on satisfying other health and safety matters and gain peace of mind of knowing you’re taking the right steps for compliance. General Regulatory Consulting: From clarification around OSHA’s HazCom 2012 and GHS, to requirements for multiple regulatory agencies across continents, we have the answers and guidance you need. Regulatory Compliance Review: This review identifies data point changes associated with ingredients in your products that may affect classification and/or the compliance of your SDSs. The resulting report provides the information you need to understand which SDSs need to be updated for regulatory compliance. SDS Compliance Check: Your SDSs are critically reviewed, and feedback is provided regarding the accuracy and compliance of the documents. Product Grouping Analysis: Product data is reviewed and critically analyzed to determine which products can be grouped on a single SDS, reducing the number of SDSs needed to represent your product line. Transportation Classification & Consulting: This includes assistance classifying products for transport, completion of Section 14 of SDSs, and transport labeling, as well as guidance around exemptions such as limited quantity, packaging and general questions about DOT, TDG, IMDG, IATA/ICAO, UN RTDG, ADR, RID, ADN, and ADG. GHS Classification Services: Products are classified in accordance with GHS for any country that has adopted the standard, resulting in a data export that can be used in SAP or other authoring software. This allows you to save a great deal of time on classification while still authoring your SDSs in-house. Confidential Business Information (CBI) or Trade Secret Registration: Acting on your behalf, our regulatory experts will complete CBI and/or trade secret registrations for your ingredients or products for Canada, the EU and other countries or regions. Ingredient Disclosure Documents: As more consumers press for details on the products they use on a daily basis, consumer product manufacturers are publicly disclosing the ingredients used in their products by issuing Ingredient Disclosure Documents and other documents. This service provides your organization with disclosure documents that follow guidelines issued by the CPSC but don't reveal your proprietary formulation. Article Assessment & Determination: Product data is analyzed to determine if it qualifies for an article exemption based on the requirements for a given country, and article safety documents are issued if requested. Workplace Labeling Consulting: Your workplace labels are critically reviewed, and recommendations are provided to ensure the labels are accurate and compliant. Consulting is also available to answer questions about label requirements from country to country. New Market Entry Regulatory Requirements: A detailed report on the hazard communication regulatory requirements is provided for a given country or region that your business is considering as a new market. This includes SDS and labeling requirements, chemical registration requirements, and other information critical in preventing holdups at customs or in-country. Translation Services: High quality translation services are available for SDSs authored by us or SDSs that you provide, in addition to technical data sheets, ingredient disclosure documents and other EH&S documents as needed. Translation services are both ISO 9001:2015 and ISO 17100:2015 certified. Access Professional Regulatory Experts – All regulatory consulting projects are completed by highly-trained regulatory analysts, specialists and/or certified experts in the EH&S industry. Improve Regulatory Compliance – The answers and deliverables our experts provide help ensure complex requirements are met, improving your organization’s overall regulatory compliance. Focus on Your Core Business – We’ll do the heavy lifting when it comes to understanding and complying with global hazard communication regulations, so you can spend your time focusing on other important day-to-day operations. Deepen Your Regulatory Understanding – Our team of experts will walk you through the answers to all your regulatory questions to ensure you not only gain a clear understanding of the information, but also how to apply it. When a project is completed, we’ll see to it that you understand what was delivered, the implications to your business and what additional steps for compliance may remain.